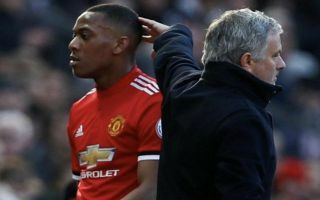 Anthony Martial was reportedly baffled to be dropped by Manchester United for the Monday night defeat against Tottenham. According to RMC, the France international found it ‘incomprehensible’ that he didn’t play a part in the game as he was not injured for the visit of Spurs to Old Trafford. This seems to continue Martial’s United nightmare, with the talented 22-year-old previously regarded as one of the most exciting young talents in the game, though now no longer a regular for the club – and didn’t even make the bench against Tottenham. Martial enjoyed an explosive start with the Red Devils when he joined in 2015/16, but things haven’t gone as smoothly for him under Jose Mourinho, who couldn’t find a place for him as his side lost 3-0 to Tottenham to make it two defeats out of three at the start of this Premier League campaign – their worst record for 26 years. RMC add that the youngster still wants out of United, but that the club are eager not to risk selling him and actually want to offer him a new contract. Should Manchester United sell Anthony Martial? The Daily Mirror recently reported that Martial may indeed be planning at staying for United for the time being after planning to rent a house in Cheshire for the next twelve months. CaughtOffside also understand that former Real Madrid manager Zinedine Zidane has been in touch with French duo Martial and Paul Pogba about expecting to get an offer to replace Mourinho in the near future. This could be ideal for Martial to gain his place back, with Zidane seeming more like the kind of manager who could get the best out of him.